Hikers and mountaineers often complain about poor or non-existent mobile phone coverage in the hills. It's true that without line of sight to a phone mast a signal is unlikely. Summits are often okay, valleys out of the question. The same problem applies to those of us who live in fairly remote area. (Very remote if you come from a city. I once had someone driving to my house turn back and phone me from the nearest town. He hadn't lost his way, as often happens, but, as he put it, "I hadn't seen a house for miles, no-one could live that far out"). Although I've had a mobile phone for over a decade I've rarely used it until recently and virtually never receive any phone calls because I've given the number to very few people as there was no signal at home (my partner did find a few places in the house next to windows where she could receive and send text messages - the signal wasn't strong enough for voice calls). However after acquiring a smartphone on a contract (to use on the Pacific Northwest Trail) after years of a basic phone on pay as you go I began to resent having hundreds of "free" minutes left over each month because I couldn't use the phone at home whilst spending money on landline calls. Now I have discovered an answer to this, which might be of interest to anyone else who can't get much of a phone signal at home. 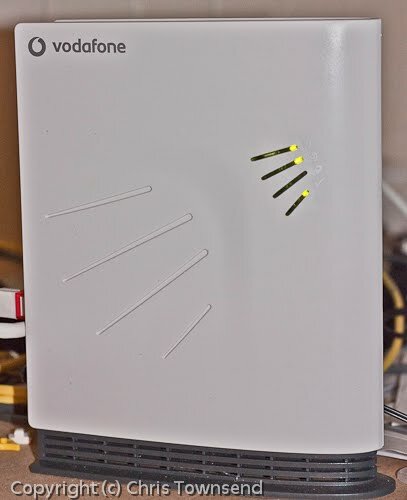 This is the Vodafone Sure Signal, which boosts the signal using your broadband connection. You need a 3G phone - I have the HTC Desire - and, according to Vodafone, a minimum 1mb broadband connection. My broadband rarely reaches more than 950kb (another disadvantage of being in a remote place) but that hasn't been a problem. The Sure Signal works really well and my smartphone works fine at home, both for making and receiving calls and connecting with the Internet. It's easy to set up - just plug it into the route and a power socket - and doesn't take up much desk space, being tall and narrow. I like it very much. Did Vodafone provide that equipment Chris, or did they sell it to you? We have the same problem here regarding cellphone signals, so much so that I ditched Vodafone (their customer service dept's response was disintrest). Vodafone provided it. Before Vodafone I'd had 02 which also didn't work here. Visitors with other networks couldn't get signals here either. Have you found a network with a decent signal? By the way, that was an astonishingly fast response! I was just editing the post having realised I'd omitted a title. My partner is on Vodafone and she struggles to get signal, we live 12miles from Vodafone HQ in Newbury! When we were in Iceland a coupe of years ago we had no trouble at all getting mobile signal, even in the most remote places. The Icelanders put our country to shame, I think we could do better. Orange and t-mobile are good in my experience but it all depends on whether they havd local sygnal stations or masts really. Vodafone in my house is a no no even by windows and im in a town. Caine99 it is funny you say that, I am in a town, on Orange any my Orange signal downstairs is iffy to say the least. Go upstairs, fine. Go to my mums a mile away, and go to her cellar, under the house, max signal. Strange. Chris, Does that box only work with Vodaphone? Do you think other makers will bring their own boxes out oneday? My dowmload speed here was 130 somethings on one of those online tests. Like you (used to), I don't use my phone for calls, and I am still on pay as you go. I have an old "deal" 5 free messages a day. Just about right for me! Seldom use them all lol. Good luck! I'm on my second and it works when it feels like it. Setup is a complete nightmare if your router doesn't automatically handle port forwarding, not to mention hardware startup order, i.e. computer first, then Sure Signal to make sure it always gets the same DHCP IP address that the router is configured to allow port forwarding to. Plus their customer support is basically non existent on this product and you get 10 different answers from 10 different support people. The thing is not useful at all AFAIC. Tony, I think it only works with Vodafone. I expect there are alternatives. Alastair, I'm sorry to hear you've had problems. So far I've had none. Setup was quick and easy with my cheap Billion brand router and when I've left it off it's started up again no problem. Just got two today, one for home and one for the office, since the vodafone signal with an iphone is patchy here in rural oxfordshire, even though we are only a few miles from vodafone HQ. I had to buy them, but set up was painless, and they work a treat. Very happy. In reference to Alistair's comment, we've produced a resource at www.notsosuresignal.com for people frustrated with the user experience of the Sure Signal devices. When they work they're great but if you experience issues then support can be somewhat lacking.